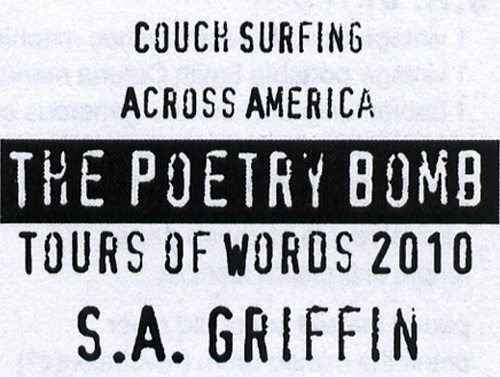 This entry was posted in S.A. Griffin and tagged Couch Surfing Across America, Poetry, S.A. Griffin, The Poetry Bomb by Monsieur K.. Bookmark the permalink. S.A. is part of the reason the world continues to spin! Go, S.A. , go! Designed and printed by Richard Hansen (The Book Collector in Sacramento) as part of his Poems For All series (PFA). I had no idea he was doing this, found out when I met up with him in Sacramento on the tour. What a wonderful surprise. He does such incredible work, and I am very honored to be included in the PFA series! He’s created close to 1,000 in this series now I think. Unbelievable. 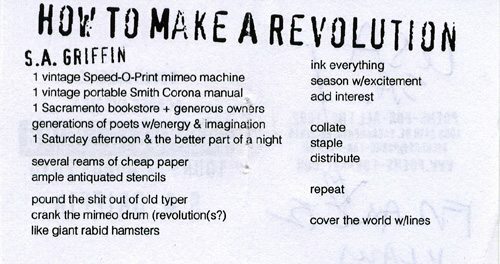 Richard is the real revolution, the real outlaw poet. He owns and operates an independent bookstore with his wife Rachel, and then creates these mini chaps on the side with no help from anyone, then gives them all away. 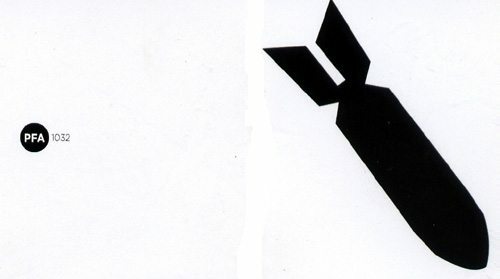 Viva small press! Viva independent bookstores! We need to have a link to The Book Collector on this site Herr Klaus. People need to know where these small bookstores are at so that they can buy their books and keep them open. Trust me, they can use the business. Theirs is a David vs. Goliath scenario in the business world. It is up to us to help keep their doors open. There really should be a resource here for cool independent bookstores, ya think? Book Collector in Sacramento being the first.